Having an AC unit is great, especially if you’re not a fan of the heat. But what should you do when your AC unit stops working? When it comes to an air conditioner not cooling properly, there may be some confusion as to what your options are. Call the repair team immediately and cough up the cash for their services? Or is there another approach you can take before resorting to such drastic measures? We’re here to tell you there is, and it’s relatively simple. Just a few short steps you can take to solve your AC problems the majority of the time. Let’s take a look at what you should do when you find your air conditioner not cooling properly. Out of the list of what you might not know about HVAC filters, the need to clean them is a priority in terms of importance. Turn off your AC unit and look for the filter which should be found in the air handler cabinet. You can access this through the door on the front. If there’s ice on the coils it will prevent your evaporator coil from doing its job. Clean or replace your filter and replace it, the ice should melt within a few short hours and your airflow will be back to normal again. A high-quality washable filter might be a smart investment because it will last up to 15 years. If step 1 doesn’t work, trying cleaning out your HVAC unit. A common cause of an air conditioner not cooling or working properly is the health status of the overall HVAC system. Clean the filters, condenser, coil, and evaporator. These can become plugged up with debris and inhibit the airflow of your unit. If your airflow gets too clogged it can ruin the entire unit over time by overworking and overheating it. As it turns out, almost 85% of HVAC repairs are needed due to electrical problems. Look at all the wiring inside your unit, especially the ones that are connected directly to an outlet. You may need to call in an electrician if your breaker is tripped or a fuse is blown. 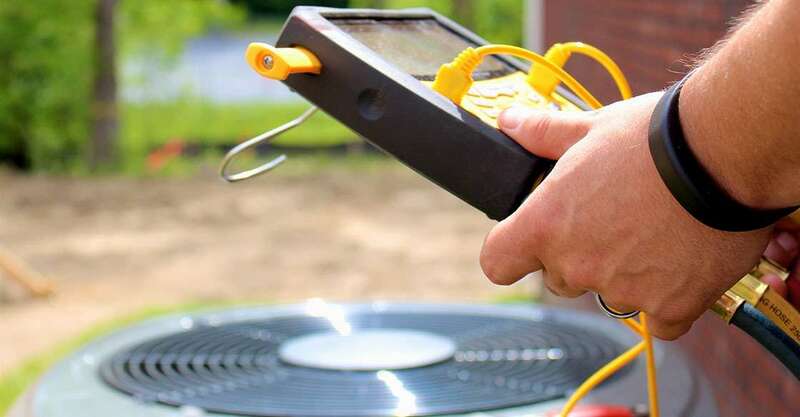 Electrical repairs are one of the 4 HVAC maintenance problems you should let a pro repair. The ductwork is like the highway for all the crisp, cold air your unit creates. If it doesn’t have the right sealing or is cracked anywhere, it could be the cause of your problems. Patch any holes, make sure it’s secured tightly, and you’ll be good to go. If you’ve exhausted your other options and you suspect you have a leak in your refrigerant, you’ll need to call in the professionals. This is the stuff that actually lowers the temperature of your home, and if it’s compromised it could completely prevent your AC unit from working properly. Even the best central air conditioner brands can develop leaks if they aren’t regularly serviced. There are quite a few steps you can take to fix the problem when you find your air conditioner not cooling properly. You can check the filter, clean out the entire inside, and check your ductwork as well. But if none of those options work you might have a refrigerant leak, in which case you’ll want to call in air conditioning services. In most cases, they can get you fixed up in a jiffy and have your AC working like new in no time. We hope that this list of do-it-yourself steps have you feeling prepared for the next time you have an issue with your air conditioner not cooling. Is your furnace broken? Take a look at our furnace troubleshooting guide!